A group of more than 55 space leaders is petitioning Congress to support commercial spaceflight in an open letter this week. The plea comes as lawmakers are debating a new federal budget, including the question of how much money to devote to NASA. President Obama and NASA chief Charlie Bolden are advocating for more funds to spur the development of private spaceships to replace the iconic space shuttle as the flagship of U.S. astronaut transportation to the International Space Station. That plan, they say, would allow NASA to invest in a longer-term project to build a rocket that can carry astronauts beyond low-Earth orbit to asteroids and Mars. The signatories of the new letter, which is dated March 1, come out firmly for the former plan. "By creating competition, and using fixed price contracts, NASA’s commercial crew program offers a much less expensive way of transporting NASA astronauts to the station than any other domestic means," they wrote. "Funding NASA’s Commercial Crew program would lower the cost of access to low Earth orbit, thus enabling more of NASA’s budget to be applied to its focus on exploration beyond low Earth orbit." Of the names on the letter, 14 are former NASA astronauts – including Apollo spaceflyer Russell "Rusty" Schweickart. Former NASA officials – such as Scott Hubbard, the former director of NASA's Ames Research Center – and many in the private space industry have also added their names. 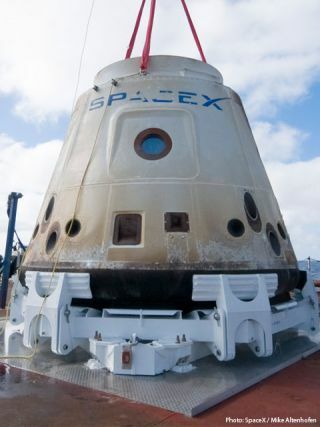 One such commercial space contender backing the letter is entrepreneur Elon Musk, founder and CEO of the aerospace company Space Exploration Technologies (SpaceX), which successfully launched the world's first private space capsule into orbit last year. George Whitesides, president of the space tourism company Virgin Galactic, is another supporter. The letter also argues that going the commercial space route would help spur the creation of U.S. jobs. "By hiring American businesses, NASA's Commercial Crew to Space Station program also generates thousands of high-tech American jobs across states ranging from Florida, to Alabama, to Texas, to California, to Virginia, to Colorado, to Nevada and to Maryland, rather than sending these jobs overseas to Russia." The letter got some lawmaker support yesterday (March 2), when Congressman Dana Rohrabacher (R-Calif.) introduced it into the record during hearings of the House Committee on Science, Space and Technology. During the hearing, Bolden defended the agency's budget request for the fiscal year of 2012. "These credentialed experts are urging that NASA fully fund the use of commercial companies to carry crew to the station because it is a strategy that is critical for the nation's success in our space efforts," Rohrabacher said. "They point out that it would lower the cost of low-Earth orbit, thus enabling more of NASA's budget to be applied to exploration beyond low-Earth orbit." Many in Congress remain opposed to the idea, though, questioning whether commercial spacecraft can be as safe or reliable as NASA owned-and-operated vehicles. NASA will get some direction when lawmakers can finally agree on a 2011 budget. For now, it is operating at 2010 spending levels along with the rest of the country under a temporary measure called a continuing resolution. Congress and Obama have until March 18 to come up with a new measure – or an official budget – before the government will have to shut down for lack of funding.